I’m thinking of renaming my blog, “The Baby Who Would Not Sleep.” Not really, but it would certainly be a fitting title. I’m pretty sure 90% of the hundreds of posts I’ve made have been about baby/toddler sleep issues. So what hair brained idea are we trying out this week to get our 16 month old to sleep? The toddler bed! 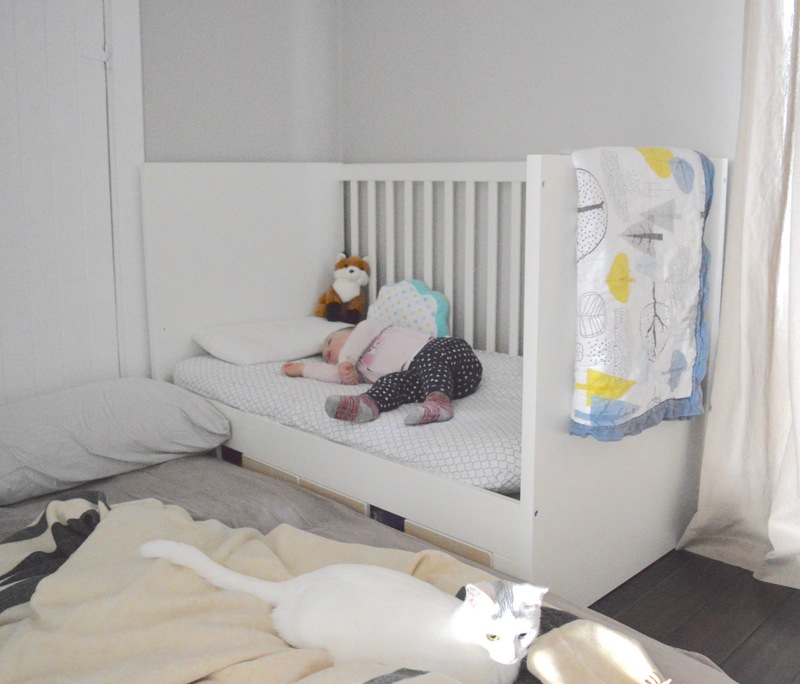 We’ve used a floor bed (crib mattress on the floor) with her before and it worked really well. The reason we stopped using it is because she started getting up and crawling away at bedtime. That was when she was about 8 months old. But now Avery is going through a phase of refusing to be put down in the crib (even when sound asleep). On the other hand, she is also now able to understand and obey when we say “lay down and go to sleep.” She’ll only do this if one of us is next to her, and it only works for wakeups through the night – not getting to sleep at first at bedtime. She still needs to nurse to sleep at bedtime. Our solution was to try something that all the parenting blogs say she is way too young for – we transitioned her to a toddler bed. Actually, we just took the side off of her crib. She was so excited when we were rebuilding it, and she wouldn’t stop throwing herself on it and snuggling with her new toddler-safe pillow (while we were still tightening all the bolts back up. Literally couldn’t wait to try it out). I’ve been sleeping on couch cushions beside her new bed and when she wakes in the night I hold her hand and say “shh, lay down and go to sleep.” So far she does, but only for me (not my wife). To get her to sleep I have to lean awkwardly over the side of her bed to nurse her, because it probably won’t hold my weight. Soon I hope to be able to leave the room once she’s settled, but I think her recent sleep issue is separation anxiety, and leaving her side wakes her up. She clearly experiences anxiety. Or screaming panic, more like. But if I’m there, holding her hand, she flops herself back down and goes back to sleep. I’ll update after a week or so of this when we get a better idea of how it’s working! If you’re interested in the floor bed idea or transitioning early to a toddler bed, I encourage you to read about why it’s recommended by the Montessori school of thought. I think that the idea of giving the kid more autonomy with sleep is something that will work for Avery, because she’s very much a power-struggler when it comes to sleep. But that kind of early autonomy won’t work for every toddler!! Hahaha I really do think part of her problem was feeling trapped behind bars! I know people who have transitioned early and it worked out great for them. Hopefully it goes better for you than it has for us! Good luck with this!! I hope that this works wonders and she feels a bit of freedom so that she can sleep a bit better! This is a great idea…. I hope it all works out for all involved. Good luck!! Hopefully you can slowly work your way out of the room and she will happily stay sleeping in her toddler bed! Love the photo of her comatose on her bed!! Thanks for the luck wishes, we’ll need it! Good luck on your journey! I’ll be reading for tips. We’re transitioning our 18 month old to her big girl bed this weekend. Super nervous Momma over here! Good luck! Are you doing anything special like letting her pick out new, fun patterned sheets? We’ve found some really adorable toddler bed ideas on Pinterest with twinkling lights and canopies that we want to try to make in the summer when we’re less busy. I don’t know about the kids, but it would sure make me want to curl up in the bed! What a great idea! I have a sheer canopy that I plan on trying, once she’s used to sleeping in her bed but hadn’t thought of adding lights. Love that! It hadn’t occurred to me to have her help pick out something for the setup. I definitely want to involve her in the process! Good luck! My sister is trying this with her toddler. It has made my niece more familiar with her crib, because they lay in it together and read books, etc. I have a son who is a finicky sleeper, too. It’s tough! Thanks! Yeah, even though we’re using the same crib that she always hated, being able to have us lean into it with her and read books in it has made her like it! That’s what we were going to do. I hit send too early! Anyway, we are all loving having a full sized bed for her on the floor. She is sleeping really well on it, compared to her usual. I am wondering if the quality of our old crib mattress was just really poor and the new mattress is a lot comfier. I hope you’re still having an easier time with the crib! Hope it lasts for you! My toddler got a toddler bed at about 16 months. She thinks it’s a toy. She tries to be smart. She shares a room with her 6yr old sister and will wait til her sister is asleep before getting out of bed and run to my room. Haha that’s a challenge I’m sure we’ll face one of these days, too! Sneaky kiddos!